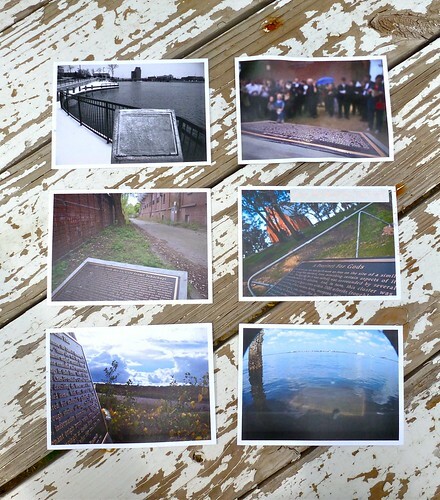 Have you been wondering about the Kcymaerxthaere Mysterious Postcards program? That image shows the back of the very first of a series of Kcymaerxthaere postcards that we started sending from around the world in 2011 (behind it, you can see a glimpse of 11th card we sent). It seems to add up to a puzzle, a mystery, a story--who knows? (well, at least we have a feeling!). All you have to do is receive them! So far we have sent out 13, and a 14th goes out in month. The project will wrap up this year. Then your work begins. Here is a great place to see all we have sent, but presented with a lot more individual flair. In fact, feel free to submit your cards photographed in cool ways. When you have them all (and you will have to figure out just when that is), you will need to put together the clues to come up with the right answer. Then, photograph either that place or an image of that place, and post it online in our Flickr group (above) or the Kcymaerxthaere FB page. One more thing: these cards and the puzzle are fun. And we would like to share it with as many countries and geographically diverse places as possible--and introduce them to Kcymaerxthaere. So far we are sending to over 65 linear countries (and a few other kinds of jurisdictions) BUT we have been saving a complete set of the cards to date for the other countries on the planet. The chance to win the prize! We also think an enterprising teacher will enjoy sharing the puzzle with their class. So we are looking for Kcymaerxthaereal geographers from the linear nations or regions on the last page. Part 6: Mysterious Postcards #13-?